Hyatt Gold Passport members can earn up to 3,000 bonus points for every three nights at MGM Mlife properties in Las Vegas between August 1 and December 30, 2014. 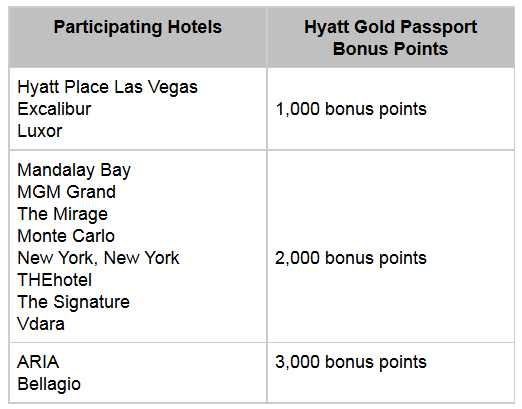 You must be member of both Hyatt Gold Passport and MGM’s Mlife programs to take advantage of these bonus points. Note that you must have at least 3 nights within one of the three bonus points categories to earn the bonus. Having 2 nights at the 1,000 level and then one night at the 3,000 bonus point level won’t earn you anything. This is a nice sweetener for those Hyatt Gold Passport members that stay at MGM Mlife properties in Las Vegas (cheap stays for Diamond qualification). Wonder how well the partnership with the Hyatt and MGM has been doing?